"A Dark Knight: That's Entertainment"
The inclusion of Victor Fries gives a whole new meaning to this week’s “cold” open. (I’m this close to getting a job in the Gotham writer’s room). Alfred and Bruce are just too cute. Their mentor/friend relationship never fails to get me all misty-eyed, even when the trigger is Alfred giving Bruce a bulletproof car for his birthday. Once again, Cobblepot and Gordon have to form a reluctant alliance. Cobblepot knows that Jerome is a force he can’t control, and he doesn’t like that. He needs subservience and predictability, which means he needs Jerome arrested. I literally laughed out loud when Gotham cut to its street music festival. How is this is a thing in Gotham? There’s no way the people of that city want shoddy rock music performed by musicians who look like circus performers. Damn, now that I type it out, that’s exactly what the citizens of Gotham would want. I wouldn’t argue with the rest of Barbara’s scenes this season being random gang leaders stepping to her, only to then get taken down by the League of Assassins. Jerome’s plan is simple: draw attention to the town square, get everyone to gather around, and then drop Scarecrow’s laughing gas on them and rid Gotham of its “seriousness.” Of course, because this is Gotham, the laughing gas will be delivered via blimp, a vehicle known for its ability to maneuver swiftly when you need it to execute a carefully staged plan. Nice little wrinkle in Bruce’s return to normalcy: Selina mentions that she always knew his anger and drinking was “an act,” but Bruce responds that he’s not so sure. That’s all the conversation they get before Alfred interrupts them though. As Barbara continues to believe she has a greater purpose, a belief fortified by a really old painting that she thinks is of her and Ra’s, Tabitha gets left behind. She’s not done for just yet though. Barbara may have abandoned her, but there’s apparently a group of followers who think Barbara is a fake, and that Ra’s isn’t dead. So, let me get this straight: Jerome takes some high-ranking society folks hostage, commands a stage at a street music festival, gets Gordon and Bullock to show up, and it’s only much, much later, when the laughing gas is on the way, that Gordon decides to evacuate the area? No matter, Jerome’s plan is thwarted, and Gotham survives another day without uncontrollable laughter. Jerome may not be gone just yet though. His last act is to send a mysterious package to his brother Jeremiah, disguised as a gift from Wayne Enterprises. 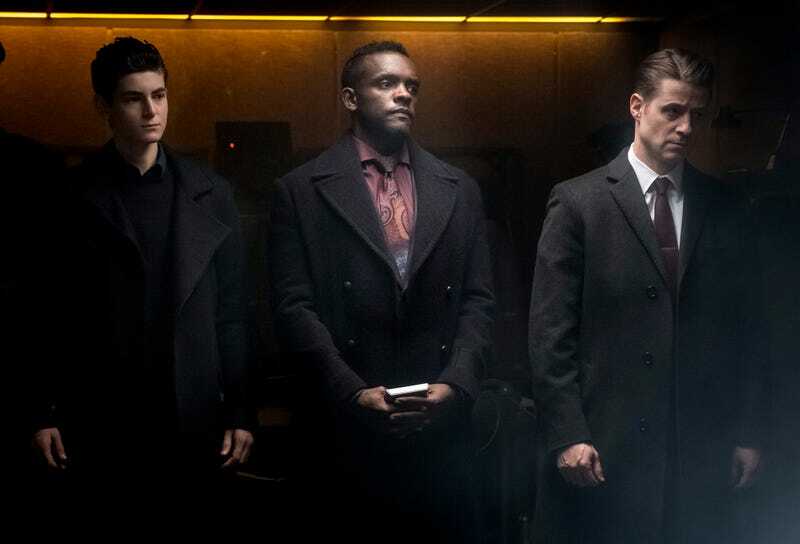 When Jeremiah opens it, he’s hit with the laughing gas and given instructions from a recording of his brother about how to take up his cause and destroy Gotham.